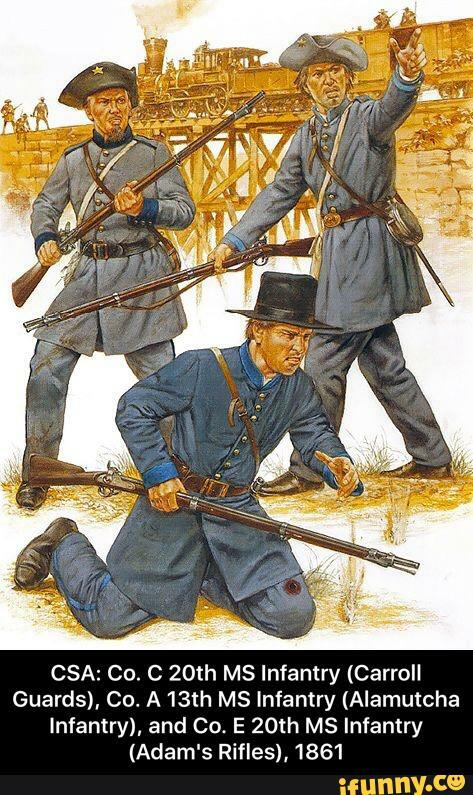 Gill was a private of the Kemper Legion who was captured twice, the first time at Fredericksburg in 1862, and, after having been exchanged, again at Spotsylvania in 1864. That time he spend a year at Fort Delaware prison until taking the oath at war’s end in June, 1865. His stone above is at Clinton, in Hinds County. More on his service here from the Mississippi Department of Archives and History. 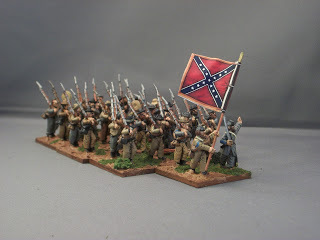 The 28mm Thirteenth on the march, judging from their right-shoulder arms. Via an Arizona wargamer’s blog. 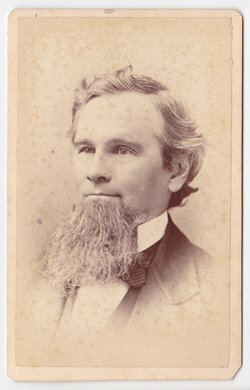 Professor T. Dwight Nutting, a Vermont native and Ohio college graduate who was teaching music in Mississippi when he organized the regimental brass band in 1861. 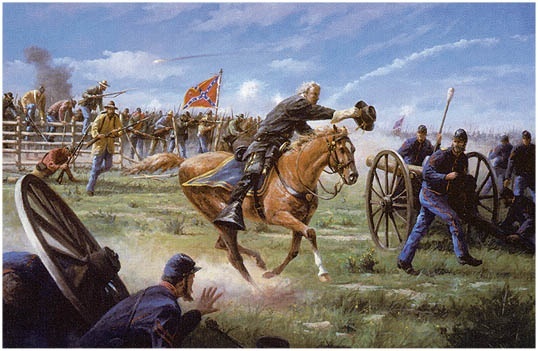 In the spring of 1862 the ensemble performed to acclaim from the Army of Northern Virginia on the Virginia Peninsula. Two years later, with the army and the Confederacy in serious decline, Nutting apparently was demoralized. The 38-year-old professor was then a federal prisoner at Memphis, where he took “the Oath of Amnesty” on March 22. The oath was a pardon issued in exchange for the signee swearing to faithfully defend the constitution of the United States and support and abide by all proclamations of the government. 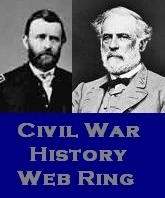 He wasn’t a soldier, after all, and Memphis was so close to Mississippi where he had lived before the war. Later in 1864 he moved to Illinois where he taught in several institutions, including the Illinois Conservatory of Music. 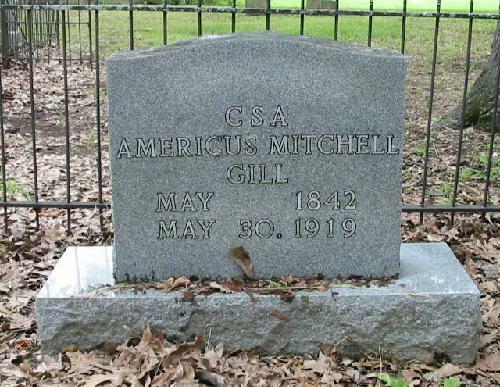 He died there in 1889 and is buried in Jacksonville, Illinois. 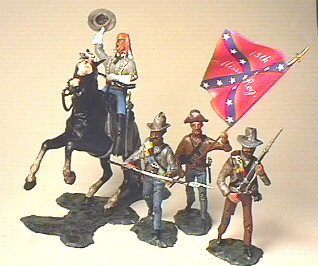 The provenance here is missing, and the Alamutchas of Lauderdale County were only Company A until the 1862 reorganization (when they became Company E until the war ended) but I like the tricorn hat with the star. Unless the wounded fellow kneeling on the ground is meant to be of the 13th. Have no idea whether either uniform is accurate, but since the Confederates often identified themselves with the soldiers and civilians of the American Revolution, the tricorn is creditable. Likewise the short, black stovepipe hat, as a contemporary preference. And the blue uniform, signifying that they didn’t all wear gray, which was a post-war notion. According to Jess McLean, this company originally came from Alamutcha in Lauderdale County but was finally named the Alamutchie Infantry. Seems unlikely Gen. B would lead a charge with his hat, as this painting by Western artist Gary Lynn Roberts has it. But there have been other fanciful notions about him. More troubling would be his rather short hair on the sides while thick on the top. Most contemporary remarks on his charge have his long white hair billowing, and we know he was bald on top without his toupee, which he was unlikely to have worn then, even if it would have stayed on. Actually, the full realization hadn’t quite arrived, but it was on the way.